Stromboli (Eolian Islands, Italy): Yesterday evening’s lava flow has once again been very short-lived. Activity (effusion rate) sharply dropped late in the evening and today, only very small amounts of lava are still overspilling from the NE crater rim. Tremor and rockfall signals are much weaker as well. A strong increase of activity occurred this afternoon. A relatively large, sustained lava flow has started to erupt from the breached NE cone and descend the Sciara del Fuoco. The process is accompanied by ongoing strong strombolian eruptions, mainly from the same NE vent, and strong continuous tremor. Etna (Sicily, Italy): This time, Etna is taking it really slowly to build up to the presumed next lava fountaining phase from the New SE crater (paroxysm). Tremor keeps rising, and strombolian explosions slowly increase from the summit vent of the cone. Strombolian activity at the New SE crater is intensifying and volcanic tremor is now steeply rising. The 10th paroxysm seems to be about to start. El Hierro (Canary Islands, Spain): A relatively strong earthquake of magnitude 4.1 occurred at 5:26 GMT this afternoon, west of the island at 19 km depth. So far, it has been an isolated event. Tolbachik (Kamchatka): The eruption continues with little changes. Strong seismicity of the volcano, although slowly declining, is being registered and accompanies ongoing effusion of lava flows and strong degassing from the southern fissure. No changes in seismic-visual activity have been reported for the other volcanoes currently active in Kamchata (Kizimen, Sheveluch, Bezymianny: actively growing lava domes associated with occasional avalanches and explosions, Karymski: occasional strombolian-vulcanian explosions, Gorely: strong degassing/hydrothermal activity). Lascar (Northern Chile, Bolivia and Argentina): Chilean volcanologists were able to make make a helicopter overfly the day before yesterday and could not find evidence of recent lava in the summit crater. However, as the likely source of the recently observed incandescence, very hot gas emissions were observed. The airborne temperature measurements gave maximum values of 600° C for the gasses, and SERNAGEOMIN thinks that the presence of magma at shallow depth is causing it. The alert level remains at yellow. Two 5.3 Earthquakes hit Fiji. 5.2 Earthquake hits Guerrero, Mexico. 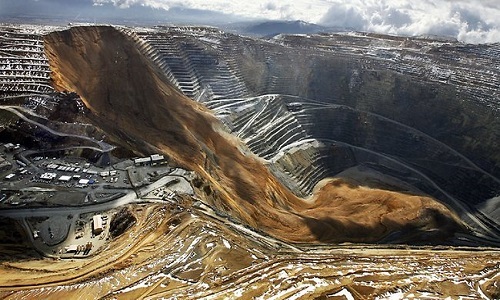 Massive landslide has occurred at Bingham Canyon Mine, Salt Lake City, Utah. No injury has been reported but the landslide has damaged roads, buildings and vehicles inside the pit. Tornado in Kemper County, Mississippi, USA has killed one person. Heavy storm in Meghalaya, India has claimed the lives of three people and injured more than 50 others. Hail storms in Georgia, Russia have caused extensive damage in the Tsinandali, Kisiskhevi and Kondoli areas. Thunderstorm in Bangkok, Thailand has caused flooding and downed many trees. Numerous railway cars were also inundated. More heavy rains in Argentina bring floods to Santa Fe. The week’s hottest temperature was 114.8 degrees Fahrenheit (46.0 degrees Celsius) at Bordj Badji Mokhtar, Algeria. The week’s coldest temperature was minus 99.2 degrees Fahrenheit (minus 72.9 degrees Celsius) at Russia’s Vostok Antarctic research station. 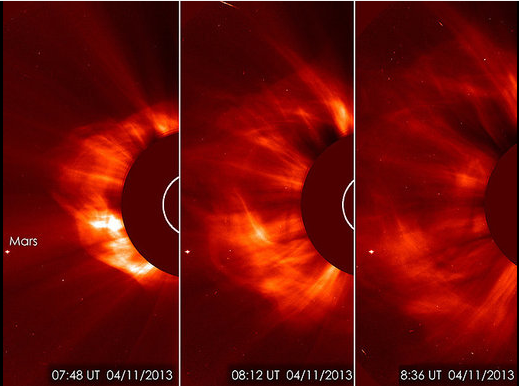 Early Thursday morning, solar observers watched as a dark spot on the sun erupted with an enormous flash of light, causing the biggest solar flare of 2013. Solar flares themselves don’t last long, but this one was powerful enough to cause a bubble of solar material called a CME (coronal mass ejection) to come bursting off the sun. Up to billions of tons of that solar material is now hurtling through space at the mind-bending speed of more than 600 miles per second, and it is heading directly toward Earth. The CME will slow down a bit as it approaches our planet, and scientists expect it will reach the Earth’s atmosphere late Friday night or early Saturday, but computer models can be off by up to seven hours either way, said NASA scientist Alex Young. While a mass of solar material zooming toward Earth sounds kind of frightening, there’s not much to worry about. CMEs can occasionally affect the electronic systems of satellites or the power grid here on the ground, but our atmosphere will protect us from any harmful radiation associated with the initial flare or the CME. As of 11 April 2013, the National Health and Family Planning Commission notified WHO of an additional 10 laboratory-confirmed cases of human infection with influenza A(H7N9) virus and one more death has been confirmed.